Polaris now offers a complete series of all-new accessory front bumpers to dress up and protect your brand new Polaris AXYS sled. The Elite Pro Front Bumper (shown here in Blue) features a wrap-around design to protect the belly pan from impacts. The stamped aluminum design adds strength and custom look to the front of your sled. Works with or without accessory skid plate. 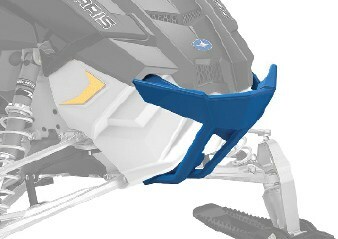 Available in six different colors, each one retails for only $184.99 at your local Polaris snow dealer, or online at Polaris.com.